Steve Ballmer was getting around to it. He was always getting around to it. That's the way Ballmer's Microsoft has worked for years: slowly, almost casually, and with no apparent sense of urgency. So, yeah, Steve Ballmer was going to retire...eventually. But then, according to lots of sources in stories from excellent journalists, Ballmer got retired by Microsoft's suddenly impatient board. As we all know now, Ballmer said Friday that he'd step down as Microsoft CEO sometime in the next 12 months. Using the classic, old tactic of dumping "bad" news on a Friday (in August, no less), when supposedly nobody is paying attention, Microsoft released Ballmer's announcement only to find out that it wasn't bad news at all. The company's stock price went up -- kind of by a lot, by Microsoft's low standards. The press and pundits took a non-cursory interest in the company for the first time in quite a while. What a surprise, huh, this positive reaction to bad news? The positive reaction shouldn't have been a surprise at all. Microsoft might have been better off announcing Ballmer's contretemps five minutes before its next earnings release, given the glee that the news has brought in various corners of the industry. The story now goes that Ballmer was thinking of retiring, oh, you know, maybe in five or six years, but Microsoft's board of directors (including Bill Gates, apparently -- ouch) thought it might be time for Ballmer to just go ahead and fade into Bolivian, in the parlance of Mike Tyson. After all, Ballmer had never really set a firm retirement date, even as he fiddled while Redmond burned around him. (Incidentally, Roman Emperor Nero, the obvious reference in that last sentence, couldn't fiddle, but he could play an early version of the organ. Just so you know.) 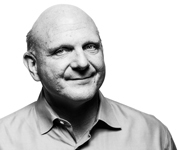 Was Ballmer going to step down in three years? Or five? Or eight? Or 17? Honestly, nothing would have surprised us. If Ballmer's tenure at Microsoft has been marked by anything, it has been his, let's say, deliberate nature and his propensity to make predictions (or promises?) and then just sort of forget about them (or fail to execute on them). Remember when Microsoft bought online advertising firm aQuantive for multiple billions of dollars (six, if memory serves) because Microsoft, according to Ballmer (as we remember it, anyway), was going to derive 25 percent of its revenues from Web advertising at some point in the future? That point has not yet arrived, and given what appears to be Microsoft's near-total abandonment of the whole ad-agency plan, despite aQuantive being the company's biggest acquisition ever at the time, it never will. How about when Bing was going to rule search and be a huge area of focus for Microsoft? Or when Microsoft was going to stick with the Zune until it defeated the iPod? Or when something called the Kin, the name of which was seemingly inspired by the Beverly Hillbillies, was going to revolutionize cell phones? How about when Jerry Seinfeld was going to march in from the '90s and make Microsoft relevant again? We don't have to Google -- sorry, Bing!...no, actually, Google -- any of that stuff to know that not only did Microsoft not reach any of those goals, it gave up on most of them fairly rapidly. Ballmer has talked a good game as CEO but has rarely followed up on his words. And that's why the Microsoft board (apparently) finally put its collective foot down. Ballmer's Microsoft just kind of does things when it gets around to it, like a college freshman not vacuuming his dorm-room floor until he can't actually see it anymore. (Yes, we remember.) Just look at the Surface tablet, which was some untold number of years in the making and is now about as relevant as a rerun of "Friends" (terrible show, by the way; always was). Or the terrible and famously despised Windows Vista, which took its sweet time to arrive despite the fact that Microsoft actually seemed to try to rush it out the door. Or Windows Phone, which waddled into the market like a substitute soccer player coming on in injury time with the game already decided. Or Windows 8. We haven't even touched Windows 8. Has anybody? A day late and a dollar short would be an extremely kind way to describe Ballmer's Microsoft, given that many of the company's most important products have been more like years late and (seemingly, although we don't know for sure) way over budget during his tenure. So, the August Friday revelation that Ballmer will soon no longer be jumping around at company events like a sweaty monkey seems to have been Microsoft's board's way of finally calling time on him. And they had to do it. After the strategic hiccups, the product failures and the embarrassing fall of the company from dominant to near doormat, even the staunchest Ballmer supporters -- and there must have been some for him to have lasted this long -- couldn't take it anymore. Left to his own devices, Steve Ballmer might have tried to hang in as Microsoft CEO for another decade. Sure, he was thinking about retirement, just as he was this close to making Microsoft relevant again. He was going to do both -- really, he was. Eventually, the way he and his company have done almost everything during his tenure. Eventually, slowly, clumsily...and, frankly, probably poorly. Soon, though, somebody else will inherit the former high-speed train Ballmer managed to slow to a crawl. For Steve, time's about to be up. Soon. Finally.